It look like we are going to get a little dose of the holidays at Disney, right from the comfort of home! 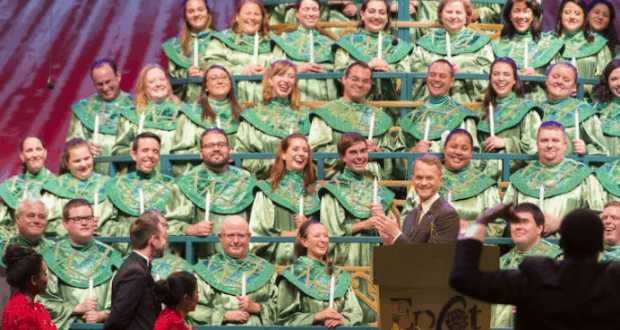 The Candlelight Processional is an extremely popular event held during the holiday season within Epcot’s World Showcase at Walt Disney World Resort. Disney Parks Blog shared that #DisneyParksLIVE will host a special live stream of the event on December 4th, 2018. The live stream will take place during the 8:15 PM EST performance with actor Neil Patrick Harris as the host for that evening’s performances. The live stream will officially begin at 8:05 PM EST so that guests can get a behind the scenes look at the show ahead of the performance. Guests that want to check out the live stream can head over to Disney Parks Blog when the live stream is set to begin to click on the link. The Candlelight Processional is held at the American Adventure pavilion within Epcot’s World Showcase. During the performance there are celebrity narrators that read the biblical Christmas story while accompanied by a 50-piece orchestra and massed choir. It is a fantastic event that has been a fan-favorite for many years! It is typically offered multiple times each evening and the celebrity narrators change every few days. Who else can’t wait to check out this live stream?